Intel is said to have finished work on its next generation Thunderbolt controller, codenamed Cactus Ridge, and it is apparently ready for Apple's upcoming Mac releases. According to VR-Zone, the new controller should make its way into the iMac and MacBook Pro notebooks, which are due for a refresh soon. New Mac Pro systems could also finally add Thunderbolt support, though the future of Apple's professional line of desktops remains uncertain. Intel's super fast 10Gbps interface is also set for a broader push beyond Apple products, as the new controllers have reportedly already begun shipping to a handful of motherboard manufacturers. There will be two Thunderbolt solutions for Ivy Bridge based systems: the DSL3510 and DSL3310. Both share the same 12 x 12 mm square and 1.35 mm height, however they differ in that the DSL3310 chip has two lanes of PCI Express bandwidth and uses 2.1W of power, while the DSL3510 provides four PCI Express lanes drawing 2.8W or 3.4W. The DSL3510 can be used for daisy chainable devices and also supports multiple internal DisplayPort inputs, meaning it could interface with a discrete graphics card as well as the integrated graphics from an Intel CPU. All in all VR-Zone claims the DSL3510 will be a lower cost, smaller and more power efficient alternative to the original Light Ridge or CV82524 chipset. This chip is likely to be used primarily in desktop systems and some notebooks, whereas the DSL3310 will end up in more power efficient notebook designs. The site also managed to get its hands on an Thunderbolt product roadmap covering what to expect for 2013. Similarly, there will be two chips to go with Intel's Haswell processors and Lynx Point chipsets. The two new models are currently known as Redwood Ridge 4C and 2C, and should bring limited support for DisplayPort 1.2, and a feature called "Power Optimizer" which isn't detailed but seems rather straightforward. 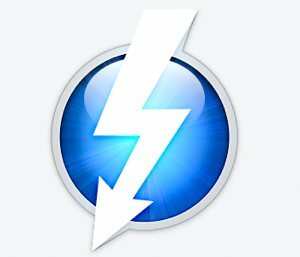 Intel has said it plans to ramp up Thunderbolt speeds to as high as 100Gbps over the next decade and plans to introduce optical cabling later this year -- at least for enterprise and commercial applications -- but the roadmap suggests that the 10Gbps bi-directional bandwidth will remain unchanged through 2013.